There has been a fair amount of recent writing from experts on both sides of the relationship arguing for its termination, or at least trimming down its scope. Bruce Riedel, a 30-year CIA veteran and Brookings expert, published a book earlier this year arguing that the United States’ strategic realignment in South Asia is long overdue and could keep the region from nuclear war. Riedel knows what he’s talking about; he was after all, the sole man in the room with Bill Clinton and Nawaz Sharif in 1999, just prior to the latter falling victim to a bloodless coup by Pervez Musharraf and the Pakistani military. The Council on Foreign Relations’ Daniel S. Markey also published a book earlier this year arguing for a profound strategic redraw of the U.S.-Pakistan relationship, based on a variety of factors – from demography to new geopolitical realities. 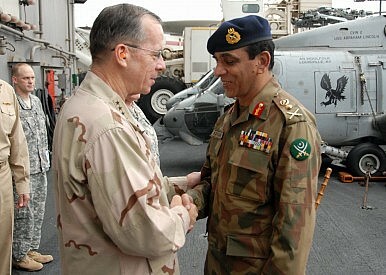 It is perhaps of little surprise that American strategic thinkers have taken to recasting the utility of the relationship after the post-9/11 rapprochement between the two countries, under Pervez Musharraf – out of necessity – ended so dramatically with the raid on Osama bin Laden’s Abbottabad hideout in 2011, a few clicks from Pakistan’s premier national military academy. Neither American author really advocates for a complete clipping of the tether – that would be far too irresponsible for the United States. Riedel advocates greater rapprochement with India while responsibly managing a strategic re-imagination of the U.S.-Pakistan relationship along more realistic lines. Markey, who makes it clear that the U.S. can’t simply abandon Pakistan right in the title of his new book – No Exit from Pakistan – outlines a limited array of policy options: “defensive insulation, military-first cooperation, and comprehensive cooperation.” Whatever their disagreements, most South Asia experts in the United States in 2013 seem to see a need for serious change in the U.S.-Pakistan dynamic. The strategic friction between the United States and Pakistan has somewhat always existed since the end of the Cold War, and has ebbed and flowed with the times. In Haqqani’s view, the bin Laden raid marked the beginning of an ebb beyond the point of no return – irreparably damaging the bilateral relationship. Between the evidence found after the 26/11 terrorist attacks in Mumbai and the fact that bin Laden was found a stone’s throw from the Abbottabad military academy, the complicity of the Inter-Services Intelligence (ISI) and Pakistani military in aiding and abetting terror, and undermining civilian democracy in Pakistan, has been apparent. Haqqani, in his writing, recalls being told as much point blank by his American counterpart, Marc Grossman, and internally agreeing; “As Pakistan’s ambassador, I could not tell my American counterpart that in my heart I agreed with his analysis,” he writes. Haqqani, who has since the events described in his memoir been the subject of controversy in Pakistan, continues to describe a series of intense anecdotes ranging from his interactions with star negotiator and Special Envoy to Pakistan and Afghanistan Richard Holbrooke to President Obama. He further cites demography, politics, and public opinion in both countries in support of his “break-up” thesis. I encourage The Pulse readers to read the piece and draw their own conclusions. In my reading, Haqqani’s account of U.S.-Pakistan relations could precipitate the beginning of a more profound strategic divergence for the two countries. Even without mentioning the burgeoning rapprochements between the United States and India and Pakistan and China, experts on both sides of the fence find plenty intrinsically troubling with the U.S.-Pakistan marriage. Haqqani, who is now treated as a traitor by much of the Pakistani elite establishment, represents a small sliver of the contemporary elite in that country. Absent from much of this discourse is the voice of the Pakistani military elite who hold a discrete set of strategic objectives and perceptions from the civilian elite. These objectives include an existential need to thwart India in Kashmir and elsewhere, fomenting a chronic state of instability in Afghanistan, and preserving Pakistan’s nuclear deterrent at all costs. Haqqani asserts that the military now see the ultimate American objective in Pakistan as complete denuclearization. Nawaz Sharif’s election and the successful transfer of power from one civilian government to another earlier this year was somewhat encouraging. However, when I saw Bruce Riedel speak earlier this year and asked him if the results of that election would really matter for the nature of the U.S.-Pakistan bilateral, he seemed less sanguine – neutering the military’s influence in national politics and priorities wouldn’t happen overnight. Nevertheless, Sharif’s government has taken bold steps to assert civilian supremacy over the military in Pakistan with the announcement that his government would prosecute Musharraf for treason. With General Ashfaq Parvez Kayani’s retirement also looming, the military may temporarily take a backseat in Pakistani politics. Amid this air of uncertainty between the Durand and Radcliffe lines, the United States finds itself at a crossroads. Whatever the outcome, the pre-2011 status quo seems unlikely to be one of them. Pakistan’s military has had a bad couple of months. Unless it rethinks its priorities, expect tactical gains to lead to strategic disaster.